The business world continuously increases its demand for more sophisticated, comprehensive, ready-made solutions that complement rapidly technologies. Our fully staffed facility is expertly equipped to handle all your pdf needs as well. 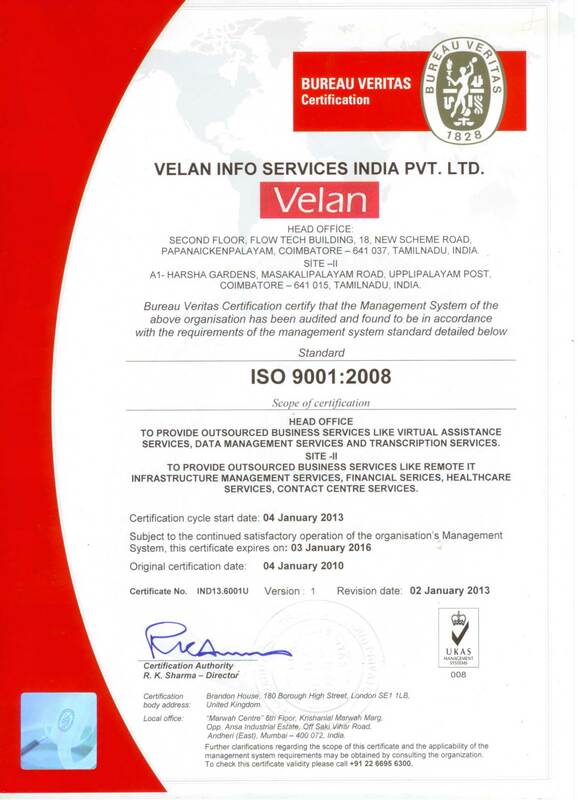 Velan relieves you of the hassle of typing and formatting documents and helps strengthen core competencies of your business. We provide timely, accurate, and cost-effective results on any word processing project. We offer you a wide range of formats, styles, and graphics to transform your documents into a professional and polished looking finished product. We regularly prepare business and personal correspondence, reports, proposals or forms. We appreciate that each client's requirements & systems are unique. Accordingly, we work closely with our clients to identify their goals, and develop practical strategies to support improvement in overall records management efficiency. We do understand that few companies store all their events in the form of audio files for its future use. Nevertheless, recorded files cannot be kept as it is because it might have lot of unwanted information or idle time. So, we go an extra mile to present a meticulous finished product! Retailers use CCTV video surveillance systems to monitor for shoplifters and dishonest employees. Manufacturers, governments, hospitals and universities use video surveillance equipment to identify visitors and employees, monitor hazardous work areas, theft. Online gaming companies use similar technology to monitor the behavior of players. We have a team of experts to monitor this 24/7 and alarm you when we find something is not on the way it is supposed to be. Copyright © 2019 Velan Virtual Assistants. All rights reserved.